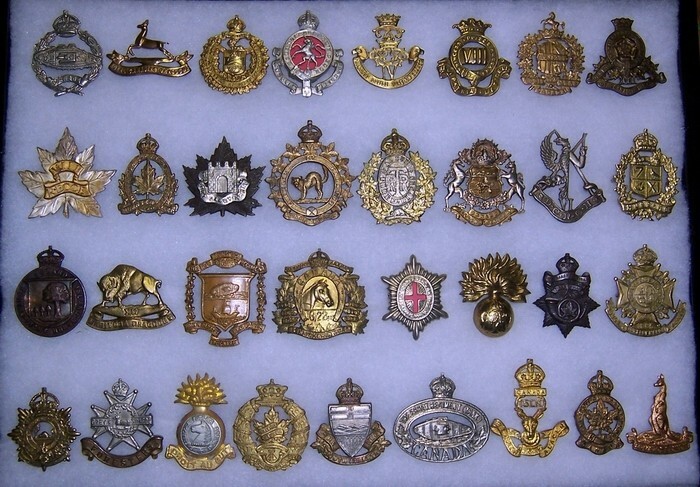 Please find an example of capbadges for ea Regt on the 1945 List of Canadian Armoured Corps units. I believe them all to be authentic period examples other than the FGH and 1CACR. Am unsure of the Halifax Rifles one. Great looking badges! Worthy of the reference section. By chance, would you know when this style badge was used by the armoured corps? I found this one in an antique shop a few days ago. Dale, I do not have my references with me but I do believe the pattern you have was introduced in 1949. I that pattern is defiantly post Second World War. pylon1357 wrote: Dale, I do not have my references with me but I do believe the pattern you have was introduced in 1949. I that pattern is defiantly post Second World War. Excellent! Then it will go great with my black cotton tanker beret I got from a Korean vet! That badge was in use from 1949 until 1953, when the monarch changed and we went to the Edwardian (Queen's Crown). The next design change was in 1969, the badge looks similar but the RCAC was changed to ARMOUR and a maple leaf added above it. The next change was in 1974, ARMOUR, was replaced with CANADA. Cliff, Clarification please. The CAC was granted the "Royal" designation on August 2, 1945. I don't have the RCAC history, but was it not at that time that the badge was changed? Mazeas does not have the mailed fist pattern badge GO dates. Hi Darrell, What type of fasteners are on the Fort Garry's? Could you post an image of the reverse of the badge? Bill wrote: Cliff, Clarification please. 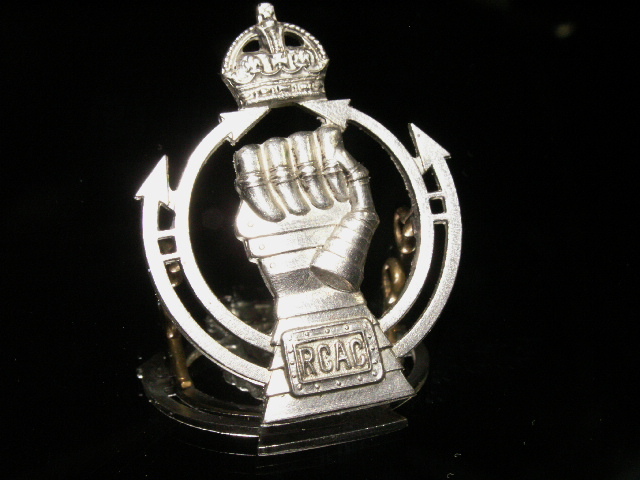 The CAC was granted the "Royal" designation on August 2, 1945. I don't have the RCAC history, but was it not at that time that the badge was changed? Mazeas does not have the mailed fist pattern badge GO dates. Hello Bill, I am not currently at home, therefore I am unable too check into my references. (read hand written notes) The above posting dates was made from these notes. These are older notes I had made, back when I lacked the foresight to record the sources. I do have the date of August 1945 as the date the "Royal" designation was granted. I suspect I got the date 1949, from the book Royal Canadian Armoured Corps, An Illustrated History. More to follow on this when I return home. Bill wrote: Hi Darrell, What type of fasteners are on the Fort Garry's? Could you post an image of the reverse of the badge? Normal lugs on the back but as the silver gate piece does not have the pins thru the leaf, I am led to believe it is post-WW2. pylon1357 wrote: That badge was in use from 1949 until 1953, when the monarch changed and we went to the Edwardian (Queen's Crown). The next design change was in 1969, the badge looks similar but the RCAC was changed to ARMOUR and a maple leaf added above it. The next change was in 1974, ARMOUR, was replaced with CANADA. 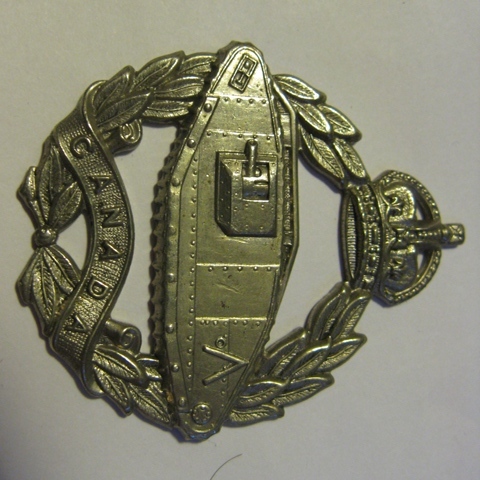 It was the CAFV TC Badge from 1939 and was a direct development by LCol FF Worthington of the British Royal Tank Regiment badge but substituting their motto (Fear Naught) with "Canada". Separate from that is the name of the Corps. The Canadian Armoured Corps came to be on 13 Aug 1940 and it's acronym was "CAC". The prefix "Royal" was granted 02 Aug 1945 in recognition of wartime services but the acronym "RCAC" was available as the Royal Canadian Army Cadets owned that. We were the "RCArmdC" until April 1946 when the Cadets lost out. The Black Hats were granted use of "RCAC" and they became "RC Army Cadets". Hello Darrell, Your Fort Garry badge looks like a good example to me. With lugs it is the type of badge worn during during the war. Thanks for that on the FGH badge. I had been told that there were post-war lugged versions but the indicator was that they did not have the long pins holding the "gate" on through the leaf and bent inwards. I'm happy to have learned different. As for the CAFVTC badge you show, the Corps History notes that the inverted "V" version was a "variant" not officially approved. It also notes there is no photographic evidence of it being worn. The design I illustrated was originally the CAFV School (later name changed to CAFVTC) badge "Worthy" had asked approval for in 1938 (denied) and again in 1939 (approved June 1940). He apparently intened it to be worn by all serving in armoured units similar to the Artillery badge. "However in later years, it was worn by officers and men serving inthe headquarters of 1 Army Tank brigade and 4 Armoured Division (4CAD) and throughout the war by all recruits and members of the Corps in reinforcement units. 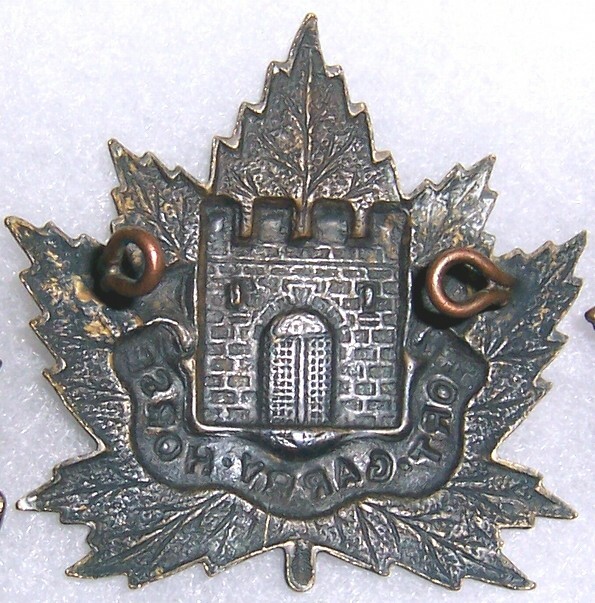 This badge thus served as the de facto insignia of the Canadian Armoured Corps until well into 1946." As the Authors (John Mateinson and Mike McNorgan) had un-restricted access to all Corps and many unit archives, records, photos, and Orders, to create the Corps history I have to lend a lot of credence to the above. What is the source for your belief that the inverted "V" variant was official to the CAFVTC, Bill?. Also, I wonder what they wore between 1946 and 1949 when the fist badge came into use. Hi Darrell, The ref is Mazeas C56 and C56a. Why would there be a variant, unless it was for a specific reason? E.g. In the documentation from archives around many badges, it is clear that when a unit title was changed, there was discussion about a different badge. This doesn't conclusively prove anything, but the provenance of the badge illustrated is from a warrant officer who spent most of the war as an instructor at the CAFVTC. He had the Canadian Armoured Corps shoulder titles in embroidered pattern, and no other CAC metal cap badges. Not to discount the RCAC history, but there are a couple of errors and omissions in that reference around badges. Re the FGH and pins on the overlay. The pattern of badges with the lugs may have beenwar time and post war. I don't doubt the provenance of yours nor any other documentation about any other badges beside the Corps/CAFVTC one but will still have to personally defer to the Corps History considering the source material avail to the authors. You know as well as I do that many unofficial variants of approved badges were made and sold by many entreprenuring individuals and manufacturers. Maybe yours was the earliest version or a privately produced version between approval and issue which apparently more than a few months? Maybe there was shortage and the Staff had some made or wanted to stand out? Maybe your man had his made in the UK/Europe (did he get overseas?)? Who knows? I do know that I've seem many many more of my version worn by Corps Troops and School/TC Students and Staff that your example(zero). That being said, I would be happy to be proven wrong that the TC and the Corps had different badges. I am afraid that Mazeas is just not that proof for me. I've been through this with the 1st Hussars badges and what era have how many leaf points joining the coronet already. As well as an FGH one with the pins and the lugs. No rush on either though; I'll just keep an eye out. The Canadian Armoured Corps was virtually non-existent in 1939, yet by 1945 was fielding two full armoured divisions (the 4th and 5th), in addition to an independent armoured brigade and numerous smaller units. It owes its existence to the tireless efforts of one man, Captain (later Major General) Frank Worthington. Known invariably as "Worthy", he had served with the Canadian Machine Gun Corps in 1918, where he learned first-hand of the value of armour on the battlefield. One of the few who stayed with the miniscule Permanent Force between the wars, Worthy never tired of pushing for an armoured element in the Canadian Army. His dream was in part realized in 1930, when he was permitted to form the Canadian Armoured Fighting Vehicle School at Camp Borden [Ontario] in 1930. Originally equipped with 12 Carden Loyd Machine Gun Carriers, this school evolved into the 'Canadian Armoured Fighting Vehicles Training Centre' in 1938, once the threat of war had driven the politicos into releasing funds for preparation. At that time, two Vickers Mk.VI light tanks were added to the CAC's strength. Ten more followed in 1939. The Canadian Armoured Corps was largely unaffected by the general mobilization in the fall of 1939. Six battalions of the Non-Permanent Active Militia had been declared 'armoured units' as far back as 1936, but it took the Blitzkrieg of May 1940 to motivate the Department of National Defence into providing the administrative infrastructure for (the now) Colonel Worthington's armoured force. The Canadian Armoured Corps was officially formed in August 1940. This information was what I was alluding to in the last post. 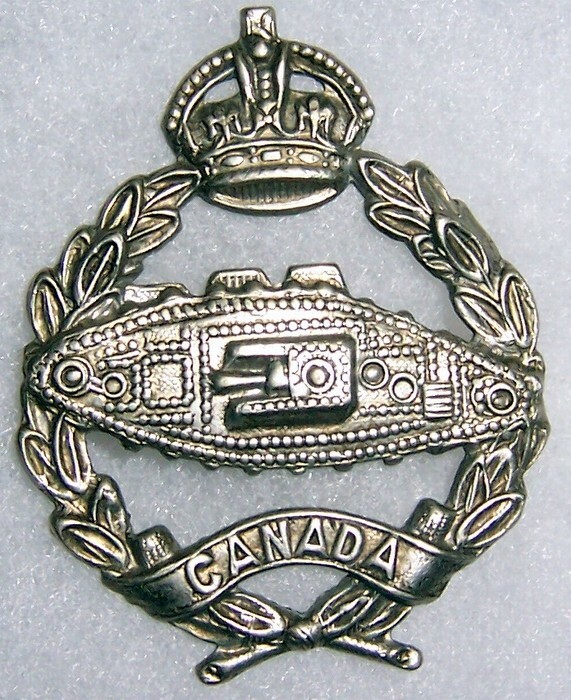 The official designation of the school, without a Canadian Armoured Corps in existence at the time, would explain the need for and the issue of a unique badge. If I remember correctly the badge was issued either before the war or very early in the war and was replaced in use by the CAC badge, as the school was subordinate to the corps, once the CAC was formed. I'll buy that. I had just read that too and am now beginning to see where you're coming from. So your man was likely a very early staff member and just retained the ealy badge as things changed and evolved into the "Corps" proper. Wait a second...........you don't show your age in your profile!! Any of the others in there you'd like to see? I sure get a few requests to see that VIIIth Recce one. Pity the lugs are gone!! Well, I'll defer to Billhere as it was he who, in post No.11 and 14 of this thread, indicated to me that my 2-piece example with lugs was possibly WW2 or immediately after vintage. Does your have long pins bent through the back of the leaf portion? Tom, Could you post an image? Bill, whats your take on these FGH badges with the long pins used to secure the overlay? Myself, I would tend to think these would be post 1953. The one shown by Darrell previous is what I have always though to be the "standard" for Second World War production. My reasoning may likely be flawed, but I based it on the design changes as it pertains to the IrRC badges. Not sure about using the pins to date the period of a badge. It is a manufacturing method, which I have seen on earlier period badges (pre SWW) and on other badges that I thought were from the same or later period.